Editor’s note: Throughout the summer and fall we will run a serialized version of PLAN-Boulder County’s A Transportation Vision for Boulder. This is part 2 of section 2. To read the entire paper, start with the Introduction. For over 80 years, conventional transportation planners have treated streets as little more than conduits for motor vehicles, and have seen little need for roads other than to maximize motorist driving speeds. Tragically, in all except our remote subdivisions, the quality of life in cities designed for cars has worsened dramatically because of the debilitating impacts that design for high-speed car travel inevitably produces. No wonder that so many flee the city for the relative safety, peacefulness, and pastoral nature of outlying areas. According to Cynthia Hoyle, the U.S. focus on fast, unobstructed travel by car has seriously undermined and otherwise discouraged transit, walking and bicycling. Roads designed for high-speed car travel are unattractive and hostile. Pedestrian street crossings are challenging and infrequent, and anyone who ventures out on a bicycle is soon harassed by impatient, honking motorists. The design speed of a road, the highest speed at which a motorist can drive safely, affects its dimensions more than anything else. Not surprisingly, traffic engineering manuals tend to call for the design speed, except on local streets, to be as high as practicable. Wide streets exert a strong influence over a motorist. First, it puts someone in a car at a greater distance from objects on either side. Looking at objects that are farther away creates a feeling that a vehicle is moving more slowly and prompts a motorist to compensate by speeding up. Second, by making the motorist survey a broad field in front of his vehicle, a wide pavement provides an assurance that he is in command of that field, which in turn induces him to increase his speed. In addition, when wide pavement means more lanes, it leaves fewer vehicles in each lane and increases the distance between each vehicle, providing yet another inducement to go faster. Thus, a major urban road with four or more travel lanes, or a broad two-lane residential street, can have a virtually irresistible effect. Even motorists who are not inclined to drive fast creep up to higher speeds. Others seize the opportunity to greatly exceed speed limits. The street tactics for increasing design speed—including such things as cutting down trees, pulling buildings and street furniture away from the street, and increasing the size of lane widths—tends to increase speeding and inattentive driving, which undercuts efforts to improve road safety. Many homeowners on such streets have essentially written off their front yards as a place to be, largely because of the speed of traffic. Motorists are more likely to collide with pedestrians at higher speeds. 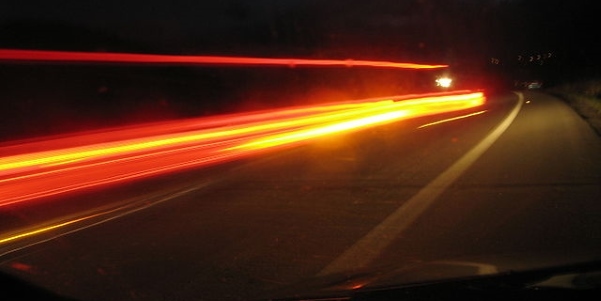 At 60 miles per hour (mph), the field of vision of the motorist is two-thirds less than at 30 mph. More importantly, the probability of a pedestrian being killed is only 3.5 percent when a vehicle is traveling at 15 mph, but jumps to 37 percent at 31 mph and 83 percent at 44 mph. Slowing cars is an essential, effective means of recruiting large numbers of additional bicyclists, and improving the overall community quality of life. The benefits of slower speed motor vehicle traffic are so numerous and significant that there is a growing worldwide movement to create what are proudly called Slow Cities. One of the most common and effective ways to reduce excessive car speeds is by using traffic calming tools. Boulder in 2001 passed a ballot issue entitled Safe Streets to create traffic circles along some streets in a town center and surrounding areas of the city. Other calming devices, especially raised crosswalks, have been installed in places such as along Norwood in North Boulder. Traffic calming involves making design changes to a street to slow down and discipline autos, and create Complete Streets rather than auto-dominated corridors. Some strategies include traffic circles, roundabouts, on-street parking, narrow travel lanes, bicycle lanes, reduction in travel lanes, woonerfs, traffic diverters, sidewalk bulb-outs, speed humps, smaller turning radii at intersections (15 feet or less), and elevated/textured/brick crosswalks that serve as speed humps. Portland, Oregon has a skinny streets program for new residential areas. It allows residential streets to be 20 feet wide with parking on one side, or 26 feet with parking on both sides. The city notes that such streets maintain neighborhood character, reduce construction costs, save vegetation, reduce stormwater runoff, improve traffic safety, and make it possible to use scarce land for purposes other than motor vehicle use. The Portland Fire Department finds that skinny streets provide adequate access for emergency vehicles. In the long run, it is more economical to purchase fire trucks that fit local streets than to build all streets to meet the needs of the largest size trucks. Studies in Berkeley, CA have shown that traffic control devices have little or no effect on police emergency response time. Roadway geometry in safety-sensitive areas, such as schools, should keep auto speeds below 25 mph. Planting vegetation such as street trees close to the street will reduce the optical width of a street, which makes it seem narrower than it is and helps to slow down motorists. A German study found that traffic calming reduces vehicle idling time by 15 percent, gear changing by 12 percent, brake use by 14 percent, and gasoline use by 12 percent. This is in part true because the greater the speed of vehicles in built-up areas, the higher the incidence of acceleration, deceleration, and braking. Similarly, a study in Portland, Oregon found that a pedestrian-friendly environment can reduce vehicle miles traveled by 10 percent. Other studies show up to a 114-percent increase in non-motorized travel on traffic-calmed streets. Another German study found that calmed streets experienced a 60 percent reduction in injuries, a 43 to 53 percent reduction in fatalities, and a 10 to 50 percent reduction in air pollution (nitrogen oxide emissions, for example, begin to increase with speeds at about 15-20 mph, and then increase sharply with speed at about 48 mph.) These substantial benefits, in addition, were achieved by increasing motorist trip time by an average of only 33 seconds. Motorists who found the 18 mph speed limit acceptable grew from 27 percent before the streets were calmed to 67 percent after the program began. Receptive residents along the streets grew from 30 percent before to 75 percent after. Portland finds that traffic circles are most effective when constructed in a series. They are sometimes also located in the middle of the block. Circles reduce motor vehicle speeds. They also reduce crashes by 50 to 90 percent when compared to two-way and four-way stop signs and traffic signals by decreasing the number of conflict points. And despite the conventional wisdom, stop signs do not affect overall traffic speeds or control speeding. Posting appropriate speed limits and enforcing them is not sufficient to achieve needed reductions in motorist speeds. Modest physical reconfiguration of streets is the only reliable and cost-effective way to slow and control traffic. Calming also helps reduce neighborhood noise pollution. From a distance of 48 feet, a car traveling at 56 mph makes ten times more noise than a car traveling at 31 mph. Reducing average speed from 25 mph to 12 mph reduces noise levels by 14 decibels (ten times quieter). At higher speeds, every 12 to 15 mph in speed increase results in a 4 to 5 decibel noise increase. It is important to learn from our past in designing street intersections. For example, in the past, we designed corners with a small radius. A corner with a radius of 15 feet or less is usually appropriate to require turning vehicles to slow down, and also shortens the distance that a pedestrian must walk to get across the street. A maximum driving speed of 19-25 mph is necessary to ensure safety, create an environment that people find conducive to walking and shopping, and minimize noise. Fred Kent, a nationally known urban designer, says that in all the surveys he has done around shopping districts, the biggest problems are not security issues. They are traffic issues—the speed of vehicles, the noise of vehicles, the congestion. According to Kent, if you design for slower vehicles, you create more of a sense of community and you increase the perception of safety and security. The Federal Highway Administration (FHA) has stated that traffic calming appears to be one of the more cost-effective ways to promote pedestrian and bicycle use in urban and suburban areas, where walking and bicycling are often hazardous and uncomfortable. By improving the quality of urban neighborhoods, traffic controls can help reverse the flight of the middle class away from the city. And as for children, Stina Sandels, a world authority on children and road accidents says that the best road safety education cannot adapt a child to modern traffic, so traffic must be adapted to the child. The FHA notes that the importance of reducing traffic speed cannot be overemphasized. Slowing traffic creates environmental improvements, better conditions for bicyclists and pedestrians, crash reductions, freedom of travel for senior citizens, and more space for children to play. The reduction in vehicle speeds is crucial to each. Reducing speeds with calming strategies is an essential way that a growing number of communities are seeking to achieve the goal of zero traffic deaths (called “vision zero”). Reallocating the right of way (also called right-sizing, road dieting or repurposing) in a road is a process in which a road is reconfigured to better serve the full range of road users, improve economic health, improve quality of life, and reduce costs, air emissions, and crashes. Typically, the reconfiguration is intended to provide new bike lanes, on-street parking, raised medians, or sidewalks, and is done by removing unneeded (or otherwise harmful) travel lanes, or narrowing existing lanes. The overall idea is to make the road less of a drive-through, car-only corridor, and more of a safe, inviting drive to corridor serving the full range of travelers and land uses along the corridor. Redesigning a road to remove capacity is counterintuitive and is the opposite of what most traffic engineers suggest for traffic problems. Yet shrinking the size of streets has been achieved on hundreds of streets in America, and is growing in popularity. Reconfiguring the street has a unique ability to correct a great many community problems. It promotes thriving town centers because it promotes slower speeds, and compact, walkable, human-scaled patterns. Some of the most effective reconfigurations are converting a four-lane, undivided street to a three-lane street (one travel lane in each direction, and a turn lane, or turn pockets). This four-to-three conversion is popular because there is almost no loss in road capacity, yet benefits tend to be immediate and immense. In a town center, to best achieve the many human-scaled benefits, streets should not exceed three lanes. Such reallocation is, among other things, a traffic-calming strategy that includes removing unnecessary travel lanes, narrowing travel lanes, and removing excessive turn lanes. These road transformations also promote community, residential and retail health, safety, community pride, reduce speeding and crashes, reduce greenhouse gas emissions, promote community attractiveness, catalyze a reversal in blight or abandonment, and increase transportation choices. They reduce excessive car use, discourage the emergence of Big Box retail, and ratchet down pressure for suburban sprawl. Because reallocating a road’s right of way (ROW) can often occur without any significant loss in road capacity, and because it can discourage low-value car trips (particularly during rush hour), there typically are less spillover car trips to nearby streets. This occurs for two reasons: (1) Removing travel lanes reduces average car speeds (which, by the way, increases road carrying capacity), and the lower speeds discourage some lower-value car trips due to the imposition of increased travel time; and (2) Some of those engaged in low-value trips perceive that the road is less easy/free/fast to drive on because the road looks smaller. In Seattle, Washington, road reallocation resulted in such obviously beneficial outcomes for businesses and residences along the reconfigured streets that property owners on two other arterial streets asked for the treatment on their streets. Overall, Seattle has completed over 30 road ROW reallocation projects, according to Peter Lagerwey. In Austin, TX, 37 projects have been completed since 1999. Given their relatively low cost and effectiveness in achieving several community objectives, ROW reallocation is one of the most powerful, affordable tools available to improve a community. Is Road ROW Reallocation Necessary or Feasible in Boulder? At first glance, removing travel lanes in a Boulder town center seems to be a good idea, since a healthy town center should be walkable, low-speed, and human-scaled. Streets are inevitably unwalkable, high-speed, and lacking in human scale when they exceed three lanes in size (as is the case of Broadway, Canyon, Folsom, Iris, and Colorado in town). But there is another way to know that such streets are over-sized in a town center, and that is through the field of economics. Economics informs us that when something is in relatively high demand, such as parking for a major sporting event—and is free to use—that resource becomes over-used or congested. If the Xcel power company offered free electricity, Boulder residents would use significantly more electricity and Xcel would need to expand its power production. If a restaurant offered free dinners, that restaurant would need to provide much more seating for the increase in patrons. If it was free to use the Eldora chair lifts, they would need to provide a lot more chair lifts. Clearly, the solution is not to produce more free electricity. Or provide more seating. Or more chair lifts. The efficient solution is to charge a fair price for those items. Similarly, the free or very cheap bread given away in the former Soviet Union caused notoriously long bread lines. The Soviets ignored basic economics and decided the solution was to make more free bread. The failure of this solution was emblematic for why the Soviet system collapsed. The same principle is applicable to streets in Boulder. Streets in Boulder have always been free to use, which means they have become heavily used to the point of congestion (at least during rush hour). Over the course of decades, Boulder and CDOT have sought to apply the Soviet solution to congested streets: provide more free capacity by over-sizing town center (and other) streets, synchronizing traffic signals, creating travel lanes that are overly wide, and providing numerous turn lanes. The result is predictable, inevitable, and unsustainable; many town center streets in Boulder are oversized. The most efficient, fair solution is to charge drivers for using the Boulder streets. But since this is impractical and very difficult politically (because decades of free streets have led drivers to expect streets to always be free), it is now necessary to use another method: reconfiguring streets that have been over-sized by decades of free access. Road reallocation is easier when the average number of daily trips (ADT) is less than about 20,000. However, there are examples of successful road reallocations for roads above 20,000. In addition, the 20,000 ADT threshold is just a guideline. Conditions vary substantially for roads throughout the nation. For example, what is the nearby cycling/pedestrian/transit infrastructure and service like? Is there street connectivity near the road candidate? Is the community willing to tolerate higher levels of car travel delay than the US norm? What is the long-term trend for ADT on the road? How efficient is the car parking near the candidate road? If inefficient, more efficient provision can reduce ADT. In terms of the effect on congestion, short-term peak traffic is more important than daily counts. When traffic engineers quote the 20,000 vehicles/day guideline, it’s a sort of engineering shorthand for the peak counts. But Boulder’s traffic counts are less “spiky” than what is seen traditionally, which means a Boulder street with 20,000 ADT generally has lower peaks than a 20,000 ADT street elsewhere. The upshot is that Boulder’s 20,000 ADT streets should be able to support ROW reallocation better than streets in cities with a more traditional traffic pattern. Or, correspondingly, the guideline for success in Boulder could be somewhat higher than 20,000 ADT. In other words, a road being over 20,000 ADT does not necessarily eliminate the road from consideration for ROW reallocation. Detailed engineering and planning studies are necessary to make the final determination and ruling out certain streets as candidates without such studies is fraught with uncertainty. Rather, street segments are proposed that seem, initially, to be good candidates worth consideration for more study. The street segments proposed appear to be over-sized and too high-speed for a healthy town center. While four-lane road configurations (2×2 without turning lanes) are the “easiest” candidates for successful road reallocation, there are examples of successful reconfigurations for roads larger than four lanes. Note, too, that of the candidate road segments proposed, only a small percentage (or none) of the total mileage contains a continuous left-turn lane, which means there are several locations where the roadway is, in effect, acting like a three-lane road, because many side streets (such as along Broadway) gather left-turning cars without a turn lane (which means the inside travel lane is often acting as if it were a left-turn lane). For example, those who frequently drive Broadway, 30th St. north of Valmont, or 30th St. south of Arapahoe know that driving in the left lane is an invitation to be stopped in a line of cars behind someone making a left turn from the travel lane. At the national level, for the first time in history, the long, steady increase in vehicle miles traveled (VMT) appears to be leveling off, and that leveling has been occurring for a number of years. We also cannot predict the long-term impact of higher fuel prices and the level of service for transit, bicycling and walking. Nor do we know with confidence how our future land use patterns will impact VMT. In addition, we do not know about other possible cost increases for car travel, such as parking, cost of cars, cost of road maintenance, economic conditions, etc. Therefore, the ADT we are seeing on certain road segments is not certain to remain at today’s level, and may in some cases decline. PLAN-Boulder County proposes reallocating the road ROW for segments that appear to be good candidates (four or more lanes and relatively high speeds in a town center). If feasible, reconfiguring these street segments would promote reductions in fuel use, air emissions, sprawl, affordability, and car travel, as well as improvements in quality of life for a town center, improvements in residential and small retail health, and an increase in non-car travel. Further engineering and planning studies will be necessary to make a final determination on whether these streets can be reconfigured. It should also be noted that like agglomeration and exchange, this approach is less appropriate in Boulder’s drivable suburbs and more outlying areas. References for this section: (1) Traffic Calming, by Cynthia Hoyle, Planning Advisory Service, American Planning Assoc., Report Number 456, July 1995; (2) CART – Citizens Advocating Responsible Transportation, Traffic Calming – The Solution to Urban Traffic and a New Vision for Neighborhood Livability. CART, Ashgrove Australia 1989: reprinted by Sensible Transportation Options for People (STOP). Oregon 1993; (3) Sustainable Community Transportation, by Todd Litman, Victoria Transportation Policy Institute, 1991.; (4) Taming the Automobile: How We Can Make Our Streets More Pedestrian Friendly, by Richard Untermann, Planning Commissioners Journal, Vol: 1:1, 1991; (5) Conservation Law Foundation. Take Back Your Streets Boston: Apogee Research, 1995. Hoyle, Cynthia L. Traffic Calming, July 1, 1995. Planners Advisory Service, Report Number 456. American Planning Association. Clarke, Andrew; Dornfeld, Michael J. “Traffic Calming, Auto-Restricted Zones and Other Traffic Management Techniques: Their Effects on Bicycling and Pedestrians.” FHWA Case Study 19, National Bicycling and Walking, Washington (DC): U.S. Federal Highway Administration, 1994. Breaking Gridlock: Moving Toward Transportation that Works, by Jim Motavalli, 1994, pg. 121. One reason reallocating the right of way is becoming more popular and successful is that for the first time in history, vehicle miles traveled is leveling off. And the “Millennial” generation owns and drives cars less than older generations. Personal email communication, August 15, 2014. The mission of PLAN-Boulder County is to ensure environmental sustainability, promote far-sighted, innovative, and sustainable land use and growth patterns, preserve the area’s unique character and desirability, and reduce our carbon footprint and environmental impact. PLAN-Boulder County envisions Boulder County as mostly rural with open land between cities and towns that support working farms on good agricultural land and provides for conservation of critical habitats for wildlife and native flora. Within Boulder and neighboring communities, urban boundaries limit sprawl and growth is directed to meet community goals of housing affordability, diversity of all kinds, environmental sustainability, neighborhood identity, and a high quality of life. PLAN-Boulder County further supports green building practices that minimize energy use and greenhouse gas emissions. In addition, PLAN-Boulder County supports a more balanced transportation system that actively promotes public transit, bicycle commuting, and pedestrian travel, and provides for smarter use of automobiles. The opinions expressed in this paper are those of the authors and do not represent the views of the various city and county organizations with which the authors are affiliated. Dom Nozzi, principal author of this paper, is a member of the PLAN-Boulder County Board of Directors and the City of Boulder Transportation Advisory Board. Mr. Nozzi has a BA in environmental science from SUNY Plattsburgh and a Master’s in town planning from Florida State Univ. For 20 years, he was a senior planner for Gainesville, Forida and was also a growth rate control planner for Boulder. He has authored several land development regulations for Gainesville, has given over 90 transportation speeches nationwide, and has had several transportation essays published in newspapers and magazines. His books include Road to Ruin and The Car is the Enemy of the City. He is a certified Complete Streets Instructor providing Complete Streets instruction throughout the nation. Pat Shanks, Jeff McWhirter, Alan Boles and Scott McCarey also contributed to this paper.